We are all impressed at how well glow in the dark items like a glow necklace look. We often marvel at how well some things look at night as they glow and stay illuminated even where there’s no light around. Though reflective dog collars are good, have you ever thought about a glow in the dark pet collar? 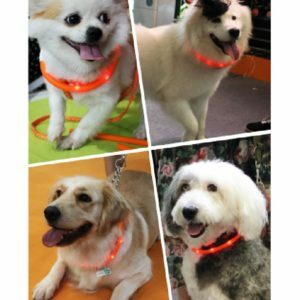 Nowadays, there are many glow in the dark products on the market and they unique way of how glow in the dark fabrics and materials can work by adding them to a pet collar or leash. 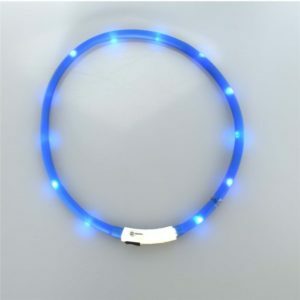 And, as a dog owner, you will understand how a beautiful glow in the dark dog collar will add a nice look and make your family pet instantly visible for added safety for your four-legged friend. But to make this work, you have to take a careful look at how such a collar can be applied. Look at how well the collar is designed. 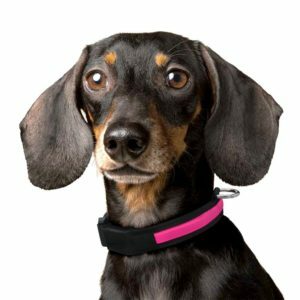 Check on whether it is adjustable or if you have to cut off a part of the collar to make it fit around your family pet’s neck and keep your dog safe. See how the glow in the dark feature is triggered. In most cases you should have a small button or switch on the end of the collar that will turn on the collar. See what power source is used on the collar. In many cases, a battery is already included and can be charged with a USB connection. In other instances, you might have to get a separate battery ready. Don’t forget to look at how well the collar feels around your dog’s neck. The collar should be comfortable without chafing your dog’s skin. Check on how far away the collar can be seen from when its lights are on. Many collars can be seen from hundreds of yards away. The first option to see is this one from Higo that comes with a nylon fabric surrounding an LED. This uses a control feature that is partially covered by the nylon so it will be hard for your dog to touch. It can turn the collar on and off. A CR2032 battery is needed for making this work. It can last for around 60 to 80 hours on average. It lasts a little longer when you have the flashing feature on the battery working. Also, the light can be seen from about a thousand feet away. Vangold made this nylon collar with a straight light ring in the middle. It has a switch that lets you turn it on or to create a fast or slow blinking effect. It also uses two small CR2032 batteries but these are already included in the collar. You can quickly open the battery cover to get access to those batteries as needed. That cover is still covered up carefully and can lock up properly so nothing can slide out of the collar. A plastic band is also used to cover up the LED ring. This does not add a bulge into the collar, thus ensuring that the nylon fabric isn’t going to be hard to disrupt. This is also available in three sizes. 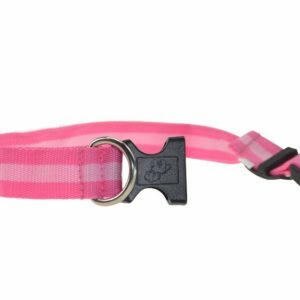 This offers a comfortable design that isn’t hard to apply and should fit on your dog’s neck depending on what you order. This is made with a silicone body that is about 27 inches long. You can double-wrap it around your dog’s neck if needed but it can always be cut to a proper size if you prefer. Either way, the end will still connect onto the base even after you cut it. This features a silicone body that is flexible and soft without irritating your dog’s skin. It is rechargeable through a micro USB connection. It can be charged through a standard phone charger for the most part. The colors can also change and display a number of beautiful hues. Three light settings are also included as you can keep it turned on or you can use a slow or quick flash. What About Options Without LEDs? 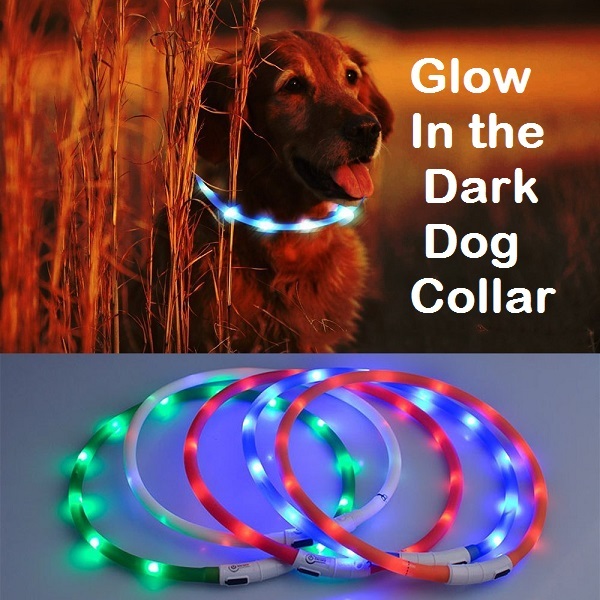 There are some glow in the dark dog collars out there that don’t have LEDs. The Bow and Arrow Glow in the Dark collar has a reflecting stitching design that allows the light that gets on its body to deflect properly. The Davis FurEver Brite Glow also uses a bright physical design to make it stand out. But those options without LEDs might not be all that bright. They might not work all that well in the darkest situations where there is hardly any ambient light. Also, some of the components in them that cause them to glow in the dark can weaken and wear out over time. These can always be considered but it is best to watch for how these can work and that you aren’t using them for far too long. Look at how well a glow in the dark dog collar will look on your four-legged friend when applied properly. Such a collar will add a brilliant look that stands out for added safety and makes your dog all the more appealing. Best of all, it makes it easier for you to spot your dog in many places so you don’t lose track of your beloved friend.